For Christmas, Sarah gave me this framed ticket from the showing of 'It's a Wonderful Life' that we went to right after we got engaged. I love it. And the fact that I still haven't gotten around to putting it up on the wall doesn't mean I love it any less. Every day for the past few weeks I've had a moment where I thought, "I should put that up today. Take a picture of it. Put it on the blog. It would be a nice thing to blog about here near the end." Today I just gave in and took a picture of it on the table where it sits waiting to be put up somewhere. I do love that ticket. This picture made me realize that I don't like that frame for that ticket. I'm going to put a picture in that frame and get a new frame for the ticket. 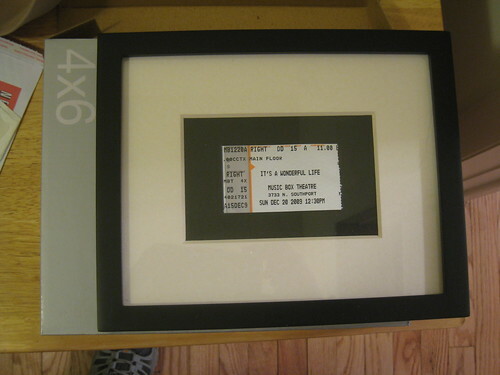 You need to frame this picture of this framed ticket with the new frame.